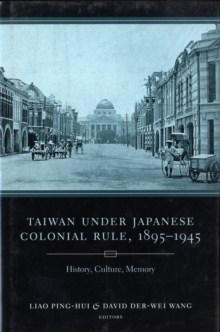 The first study of colonial Taiwan in English, this volume brings together seventeen essays by leading scholars to construct a comprehensive cultural history of Taiwan under Japanese rule. Contributors from the United States, Japan, and Taiwan explore a number of topics through a variety of theoretical, comparative, and postcolonial perspectives, painting a complex and nuanced portrait of a pivotal time in the formation of Taiwanese national identity. Essays are grouped into four categories: rethinking colonialism and modernity; colonial policy and cultural change; visual culture and literary expressions; and from colonial rule to postcolonial independence. Their unique analysis considers all elements of the Taiwanese colonial experience, concentrating on land surveys and the census; transcolonial coordination; the education and recruitment of the cultural elite; the evolution of print culture and national literature; the effects of subjugation, coercion, discrimination, and governmentality; and the root causes of the ethnic violence that dominated the postcolonial era. The contributors encourage readers to rethink issues concerning history and ethnicity, cultural hegemony and resistance, tradition and modernity, and the romancing of racial identity. Their examination not only provides a singular understanding of Taiwan's colonial past, but also offers insight into Taiwan's relationship with China, Japan, and the United States today. Focusing on a crucial period in which the culture and language of Taiwan, China, and Japan became inextricably linked, Taiwan Under Japanese Colonial Rule effectively broadens the critique of colonialism and modernity in East Asia.